Hello, readers, and welcome back to our blog. Today, we will begin looking at some helpful ways to prepare your car for bad weather in the first installment of a short blog series. Here at West Texas Windshields in San Angelo, we know that the weather can change quickly from a hot, sunny day to stormy afternoon complete with wild downpours and tornado warnings. San Angelo experienced severe weather that caused widespread damage in the region back in June, but now that we’re in the middle of the 2017 Atlantic hurricane season, the weather may get rowdy between now and November. We wanted to take advantage of this opportunity to offer some tips for preparing your vehicle for bad weather because when a storm is coming, it’s best to make sure you and your vehicle are prepared with the tools and supplies you need. Please continue reading to learn more. One of the first defenses against poor weather is your wiper blades, yet windshield wipers are often neglected. Good wiper blades help keep your windshield clear of fluids, mud, and other debris that can obstruct your vision during a storm. If you know that bad weather is coming, it’s best to replace your old wiper blades with quality blades; Rain-X and Michelin are two brands that make excellent, cost-efficient wipers that are worth the investment. If you notice streaks on your windshield or can see that your wiper blades have reached their end, replace them! Replacing your blades every six months is a good rule of thumb. The last thing you want during a bad storm is a shredded or flat tire, and you definitely don’t want to lose a headlight in the middle of a storm, especially at night. Therefore, you should always check your tires, as worn out or deflated tires won’t help you at all during stormy weather. Replace worn tires or have them rotated. Additionally, check your headlights, brake lights, turn signals, and hazard lights to make sure they’re functioning properly. Lightbulbs are relatively inexpensive, so it’s a good idea to keep spare bulbs in your glove box or auto toolbox. When it’s storming like crazy, the last thing you want is to run out of wiper fluid, antifreeze, or worst of all, gas. Check all you main fluids and top off any that are low. Wiper fluid is one of the least-checked fluids because once you fill up the container, it seems to last forever. Keep an extra bottle of wiper fluid in your car so that you never have to worry about running out of fluid during a thunderstorm. Ensure that you’re prepared for emergencies and sudden car issues with a roadside emergency kit. Get a storage bin and stock it with wiper fluid, antifreeze, tire sealant, extra oil, a flashlight, a reflective hazard triangle and vest, work gloves, paper towels, a flare gun, and any necessary tools you may need. This will be helpful if you get caught in a bad storm and encounter an emergency while on the road. We hope you have found these tips helpful. 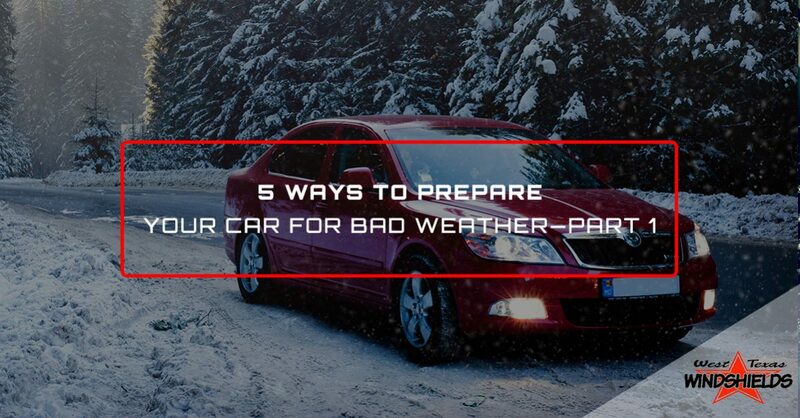 Be sure to check back for part two of our short blog series to learn more ways to prepare your car for inclement weather. If you have any weather damages to your windshield, contact our experienced auto glass technicians at West Texas Windshields in San Angelo to schedule an appointment for a windshield repair. Stay safe out there and we’ll see you next time!